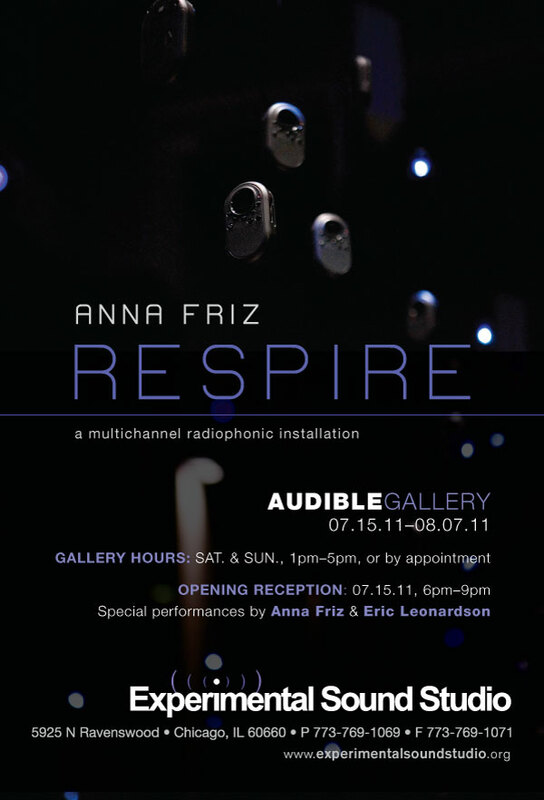 I’m hanging my multi-channel radio installation Respire at the Experimental Sound Studio (ESS) in Chicago this week, with the opening reception coming up on Friday July 15, 6PM-9PM. My good friend and partner in sonic crime Eric Leonardson will be joining me to play at the opening, where we’ll each improvise with the radio world of the installation. Respire will stay up until August 7, and will continue to change as I meddle with the transmitter configurations, composition, and interference potential. ESS has kindly let me use their Audible Gallery as a project space for the duration of the show, so I can continue my research into multi-channel radio systems. Gallery hours are Saturdays and Sundays from 1-5PM, or by appointment during the week. You can email me here as well and see when I’ll be in the gallery if you want to hang out and move antennas. Respire is an intimate experience of radio transmission, featuring a multi-channel array of suspended radio receivers and micro-watt transmitters. 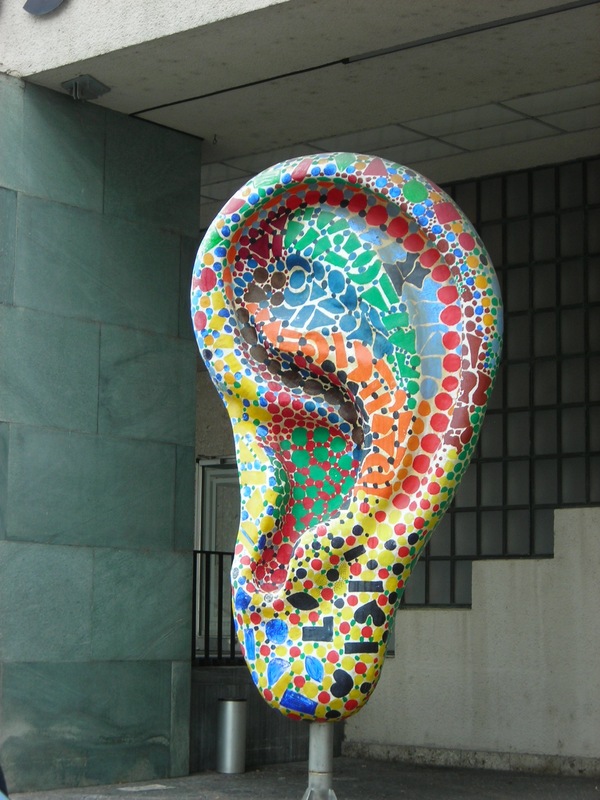 Sounds of breathing and other bodily exclamations typically absent from regular radio programming seep up through the welter of signals, as the receivers play and emit their own oscillating frequencies. This milieu of harmonic interference and uneasy nighttime respirations reveals the invisible contours of the radio landscape that surrounds us. Other sounds are created from instruments that echo human breath (harmonica) or the detuned radio landscape (theremin). 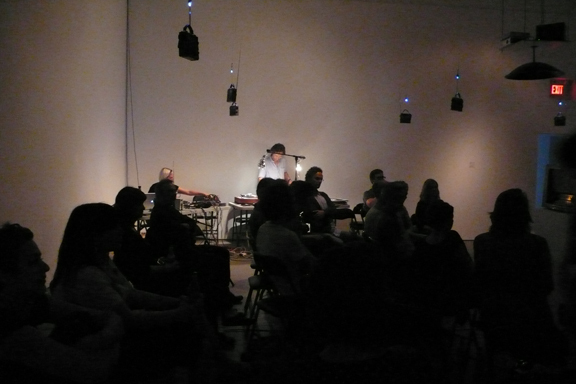 The space is very intimate–a little sun-dappled box 6m x 6m. For the opening I blacked out the windows and lit the radios with small LED lights, but later on during the installation, I removed the blacks and lights to return the installation to “daytime mode”. New to the array this time around were the chirps and sounds of satellites, which were remarkably insectoid. Much like the similarity between human breath and static, the satellites-as-insects or frogs are striking for the way electro-magnetic and organic phenomena can sound so similar. 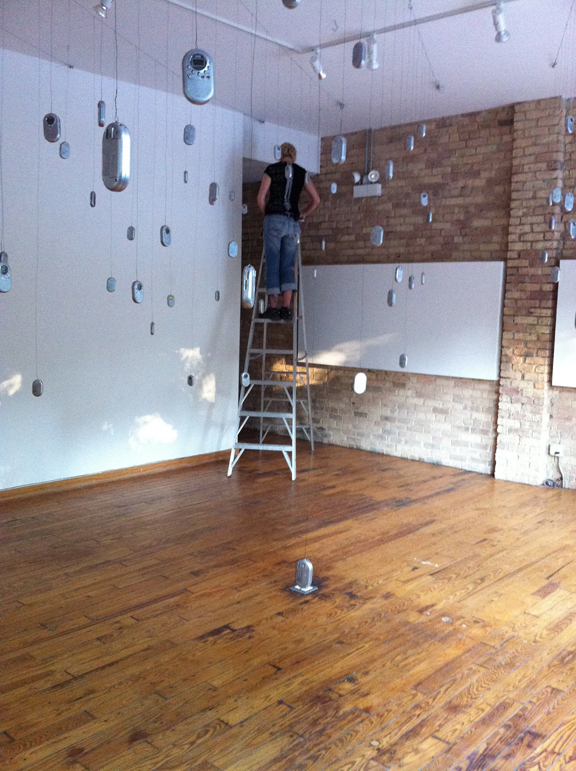 Eric Leonardson took a picture during the install: that’s me on a ladder, hanging radios once more…..
I’m performing in the first full run of Evalyn Parry’s SPIN, a show about bicycles, early feminism, consumerism, and collisions in traffic and of heart. Written and performed by Evalyn Parry, with Brad Hart on the bicycle, and me on a variety of instruments, from accordion to mbirra to bike lights. Thanks to contact mics, the table is all mic-ed up too, and I play that with a leatherman tool. 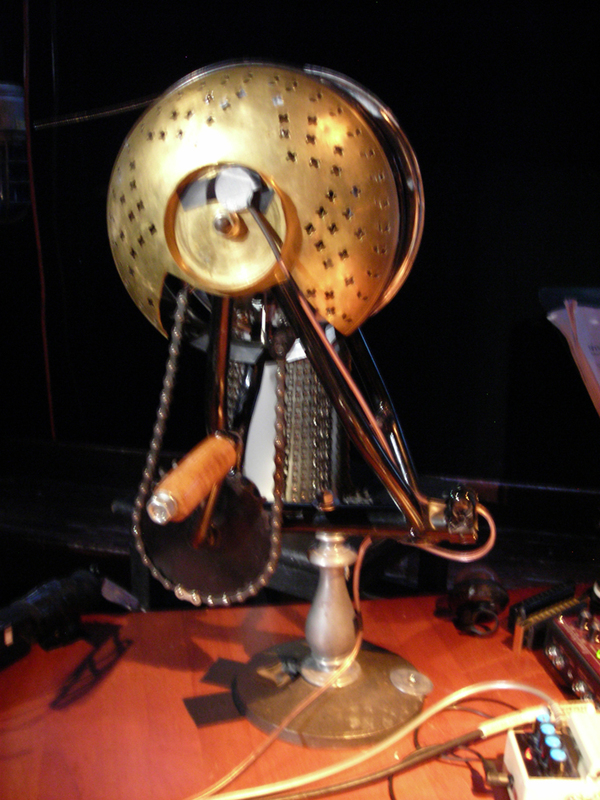 I’m especially pleased to play one of Iner Souster‘s junkstruments, which we have dubbed the Time Machine. Show runs until March 27, 2011, at Buddies in Bad Times Theatre in Toronto, Wed-Sun nights at 8PM. Reserve tickets! I’ve designed the sound mostly from tape detritus, and predictably, I’m playing the score for this show entirely from cassette, with some electronic effects (and a few Califones cassette players thrown in for good measure). For tickets and more info, check out the Theatre Centre’s page. 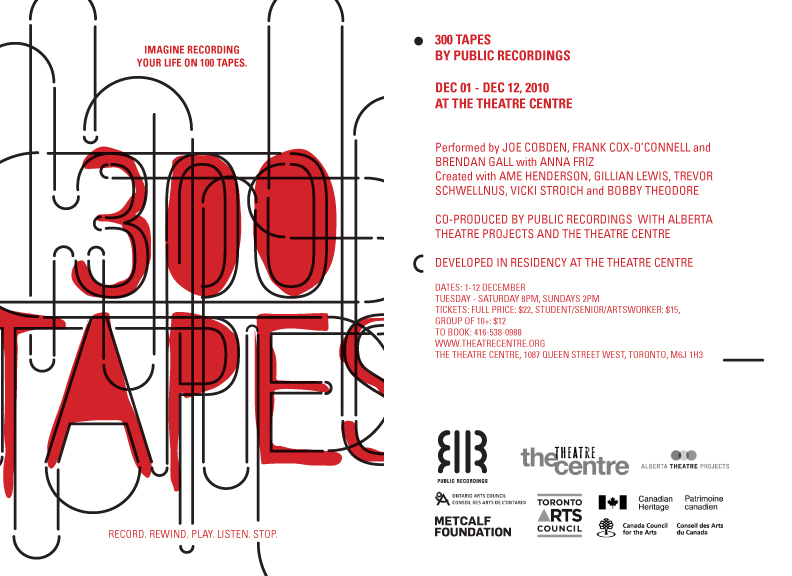 300 Tapes will travel to Calgary for the Alberta Theatre Projects’ playRites Festival in February 2011, and from there to points beyond. A nice little review by Kevin Hegge of NOW magazine can be found here. E.C. Woodley and I have an interesting side project going titled after his long-running radio show on CKLN 88.1FM here in Toronto. He brings the records from his most recondite collection (featuring spoken word and misc. arcana pressed to vinyl back when the top speed was 78 rpm) to sample in long form, and I bring the glorious noise of radio world, all spatialized into three vertical layers of sound. Our most recent gig was at the opening of Deep Wireless on May 1, 2010, and the above photos are from our previous outing at Mercer Union‘s “Music in Alternative Spaces” in July 2009 (both locations in Toronto). Our set-up riffs on traditional radio listening (the big central radio around which the audience gathers), as well as my multi-channel tactics (in this case, an array of hanging radios, and speakers above the radios in the ceiling). “The Lost and Found” is an ongoing collaboration between Anna Friz and E.C. Woodley to explore phenomenologies of recording, radio, and electricity, and the materiality of the transmission environment. 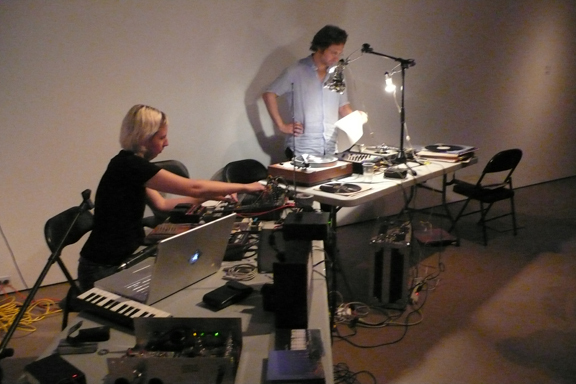 Woodley uses three turntables to work with curious recordings, giving preference to these sounds as discrete entities, an audio equivalent to the approach Canadian visual artist Greg Curnoe used in his collages of the ‘60’s. Friz adds VLF, shortwave, interfrequency static, and live electronics to the mix, and spatializes the sound via multi-channel micro-radio transmission to an array of vintage receivers. 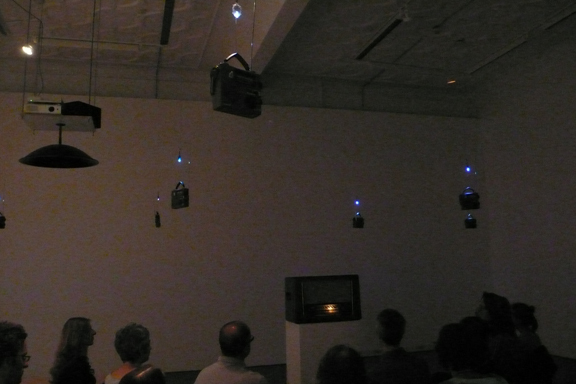 “The Lost and Found” convenes a communal ritual of radio listening, and promises an evening lost and found voices heard in the dark corners of the radio dial. 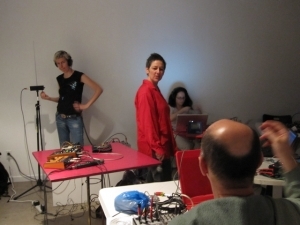 Friz and Woodley met in 2005 over an impromptu collaboration on Woodley’s long-running radio program (also named “The Lost and Found”) on CKLN-FM in Toronto. Woodley has also written music for many films including Terry Gilliam’s “Brazil” and his brother Aaron Woodley’s “Rhinoceros Eyes”, “Toronto Stories” and “Tennessee”. I know, I know, another scene of sound artists pouring over gear on a table. At least we sit off to the side, so people can choose if they want to watch us twiddle our knobs or not. For the Deep Wireless gig we had the lighting adjusted better than in these photos, and I also replaced the Grundig Emergency radios in the array with a series of bigger transistor radios from the late 60s-early 70s (Nordmende Globetrotter, Transita, and Corvette; plus a Bel-Air and a Panasonic). 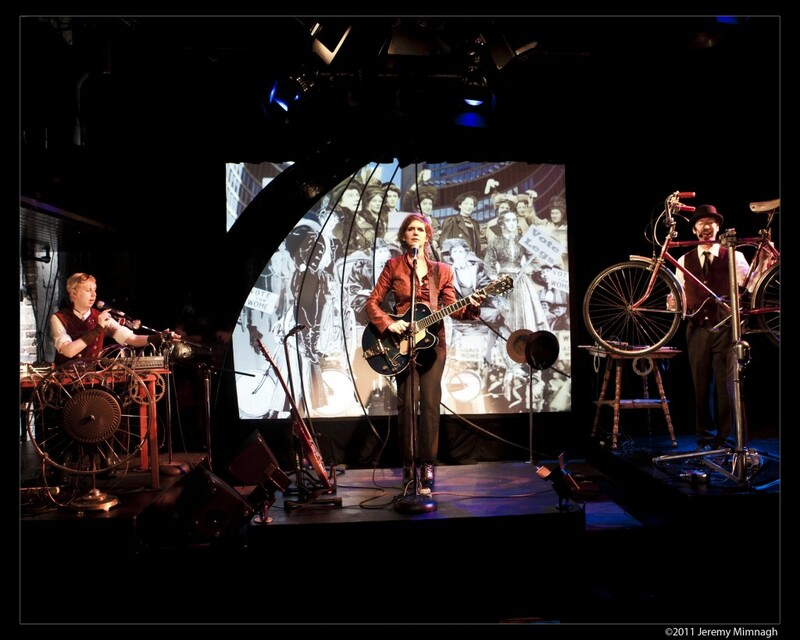 October 25, 2009, at the Hysteria Festival of Women at Buddies in Bad Times Theatre, I’ll be performing as part of Evalyn Parry‘s fantastic new bicycle piece– she has written a new suite of songs, stories, and spoken word about bicycling today and in the roaring 1890’s. Brad Hart plays the bicycle, and I play the pedals and lights, as well as some other free reed instruments like accordion, harmonica, and melodica. If you’re in Toronto, it’s one night only (at least for this time around), but look out for more dates to come. 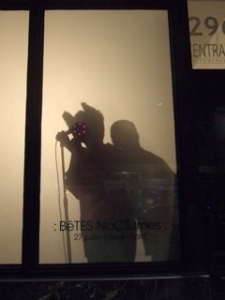 Saturday, June 27, 2009, in the window of La Centrale Galerie/Powerhouse, on St-Laurent Boulevard, in Montréal: watch and listen for Les bêtes nocturnes! Sound artists project out on St Laurent the sounds that shift our quotidian experiences: they are repetitive, electronic, random, strange, and yet so distinctively animalistic. It’s dark in there but if you look closely, you might catch a glimpse of those rare mutated creatures of the night, through the window of the gallery-become-zoo. The best time to hear the beasts is after sunset (10pm), before sunrise (5am). Bring your lawn chair and binoculars. Anthropologists, ethnomusicologists, and field recorders are welcome to this rare opportunity to witness animals improvising with lo-fi poetics. Magali Babin, Myléna Bergeron, Martine H. Crispo, Nicolas Dion, Chantal, Dumas, Nikki Forrest, Anna Friz, Jackie Gallant, Anne Françoise Jacques, Martin Tétreault, Nancy Tobin.